I recently came across Julia Lesage’s interesting column, “Watching for Botox,” on Flow. In her critical “auto-ethnography,” Lesage wants to “reflect on how cosmetic surgery appears on television and in public life, and why.” She contrasts “good work,” where various high-profile figures and celebrities get work done to presumably maintain public status, on the one hand, with makeover and plastic surgery shows, on the other hand. She shows televised images of the faces of Bill and Hillary Clinton, Pat Robertson, Lily Tomlin, and Glenn Close, noting their smooth facial features, and thinks of their enhanced faces as “open secrets,” visible counterpoints to the excessive narrativization of cosmetic surgery and scrutinization of bodies, often of lower-class people, on popular reality makeover shows. Lesage’s piece reminded me of a video I’ve been meaning to post here. The model/spokesperson for Juvéderm begins, “Parentheses have a place, but not on your face.” As she says this, she gestures the shape of parentheses between her nose and lips, and purple, textual parentheses are drawn over this area. The parentheses close in, and move to the right side of the screen, with the words “not on your face” between them, while the model’s face moves to the left side of the screen. Parentheses proceed to figure prominently. Next they appear around the words “up to 1 year!,” reinforcing the line she recites regarding how long Juvéderm lasts. Then they appear around the words “your doctor does it,” slightly shifting the verb that she speaks (from “uses” to “does”), while the model back-kicks the left parenthesis, peeking her smiling face through a grid of circles(?). She then makes the parentheses gesture around her face again as she refers to the “lines on the sides of your nose and mouth,” claiming that they disappear instantly with Juvéderm, while visually a pair of parentheses with the words “did she say instant?” inside open up, as the model leans against the left parenthesis. As she reads the possible side effects (bumps, swelling, pain, etc. ), she smiles, triumphantly raises her hands up high, and spins through a pair of parentheses with Juvéderm contact info contained inside. She says, “Smooth, natural. Everyone will notice, but no one will know.” The text of “smooth” and “no one will know” each appear onscreen, getting a separate pair of parentheses. The parenthetical play throughout this commercial undoubtedly serves to drive home the jingly message of the first sentence: that “parentheses have a place, but not on your face.” We see them used to contain text, interacting with the words she speaks (and, playfully, with the moves she makes). Nasolabial folds, the curved lines extending from your nose to your lips, are often described as parentheses. Referring to wrinkles, the metaphor resonates with the “unwanted” cultural textuality of parentheses, as I have expanded upon in other entries here and elsewhere. What is frustrating about the commercial’s cutesiness is that, while text doesn’t belong on faces (unless it’s tattooed, I suppose), these folds do. Interestingly, not only are parentheses used to describe these facial lines, but they also are used to represent lips in smiling and frowning emoticons. Parentheses may not belong on faces, but they make faces. There has been a lot of fascinating scholarship on the face that I would be interested to read through these different facial parentheses. Gilles Deleuze has written, “It is not surprising that . . . it is the face, with its relative immobility and its receptive organs, which brings to light . . . movements of expression while they remain most frequently buried in the rest of the body.” This is to say that we read into slight details on the face, so as to better understand complicated, otherwise unarticulated, affects. This also explains in part why the “close-up” has been so important to many different film theorists, and why the concept finds continued relevance today in the work of many contemporary media theorists. I wonder to what extent the desire to cosmetically remove facial “parentheses” is related to the ability to alter representations of the face in digital compositions. And, moreover, I wonder what this might mean in light of the face as a site of affective reading. 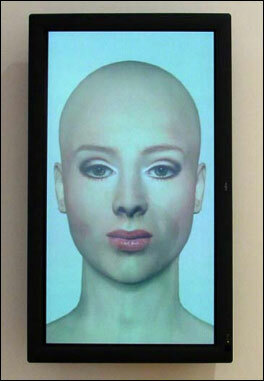 The smooth, digital face above is from Kirsten Geisler’s Dream of Beauty 2.0, from 1999. Mark Hanssen has argued that the “encounter with the Digital Facial Image (DFI)” is a “new paradigm for the human interface with digital data,” represented by works such as Geisler’s. Geisler’s work is also critiquing this interface, longing for the wrinkles and subtleties that make us human. Up in the Air was one of the most critically acclaimed movies last year, evidenced by a 90% on Rotten Tomatoes’ tomatometer, and its position as one of the top contenders for last year’s best picture Academy Award. When I went to see it with a couple friends this past winter while traveling in San Francisco, I was surprised to notice a memorable reference to parentheses at a key moment in the film. In the film, George Clooney plays Ryan Bingham, who travels around the country to fire people at companies who have hired his company to lay people off. He happily spends more days than not “up in the air,” en route from site to site, living his life out of his suitcase, accruing a record number of frequent flyer miles. Bingham meets Alex (Vera Farmiga), who seems to lead a similar life with a similar philosophy, and they begin a casual, playful romance, meeting occasionally when they can arrange to overlap in particular cities where they might be traveling. One day, after deciding he wants to take things to the next level, he shows up unannounced at her home in Chicago . . . to discover that she has a family. This “derision,” in the form of the parenthesis, as a textual metaphor, calls attention to the writerly dialogue of the script, and seems to be a figure around which people who both like and dislike the film’s writing can praise or criticize the film more generally. The metaphor itself is interesting too, because I don’t think I’ve heard a person called a parenthesis before–I think this is also part of the reason why this exchange is effective at sticking with many people. It’s an unusual metaphor, but one that plays into a shared cultural perception of the punctuation mark as insignificant.